In a bulletin sent Christmas Eve to about 18,000 police organizations, the FBI said terrorists may use almanacs "to assist with target selection and pre-operational planning." It urged officers to watch during searches, traffic stops and other investigations for anyone carrying almanacs, especially if the books are annotated in suspicious ways. "The practice of researching potential targets is consistent with known methods of al Qaeda and other terrorist organizations that seek to maximize the likelihood of operational success through careful planning," the FBI wrote. The Associated Press obtained a copy of the bulletin this week and verified its authenticity. "For local law enforcement, it's just to help give them one more piece of information to raise their suspicions," said David Heyman, a terrorism expert for the Washington-based Center for Strategic and International Studies. "It helps make sure one more bad guy doesn't get away from a traffic stop, maybe gives police a little bit more reason to follow up on this." 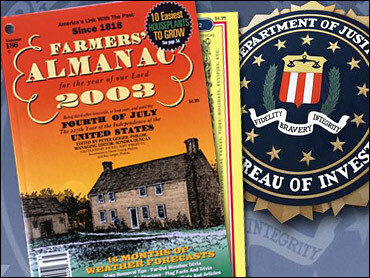 The FBI noted that use of almanacs or maps may be innocent, "the product of legitimate recreational or commercial activities." But it warned that when combined with suspicious behavior - such as apparent surveillance - a person with an almanac "may point to possible terrorist planning." The publisher for The Old Farmers Almanac said Monday terrorists would probably find statistical reference books more useful than the collections of Americana in his famous publication of weather predictions and witticisms. "While we doubt that our editorial content would be of particular interest to people who would wish to do us harm, we will certainly cooperate to the fullest with national authorities at any level they deem appropriate," publisher John Pierce said. The FBI said information typically found in almanacs that could be useful for terrorists includes profiles of cities and states and information about waterways, bridges, dams, reservoirs, tunnels, buildings and landmarks. It said this information is often accompanied by photographs and maps. The FBI urged police to report such discoveries to the local U.S. Joint Terrorism Task Force.